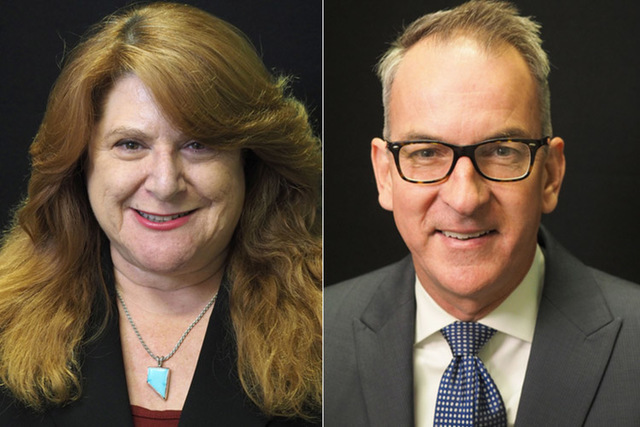 Fourth-generation Nevadan and lifelong resident of Assembly District 20, Darren Welsh, is campaigning in the district’s Democratic primary on a different plank against incumbent Ellen Spiegel, who seeks a third term representing the district. Darren Welsh’s first political platform didn’t last long. Welsh won a seat on a fifth-grade advisory committee with a simple promise: running Kool-Aid through water fountains. “It didn’t happen — they said they were worried about cavity problems,” Welsh said. Now the fourth-generation Nevadan and lifelong resident of Assembly District 20 is campaigning in the district’s Democratic primary on a different plank against incumbent Ellen Spiegel, who seeks a third term representing the district. Spiegel’s political activism in the district might not go back decades, but she said her tangible results in the Nevada Legislature make her the right choice. One of her proudest achievements was the 2015 passage of Assembly Bill 206, which required schools to add information about low-cost assistance to notices sent home to the families of kids facing vision or hearing problems, certain physical disabilities or bullying. The measure didn’t cost the state or the school district money, she said, because the letters were going home anyway. Her priorities in the 2017 Legislature would include job creation and workforce development; the state’s shortage of health care providers; solutions for teacher shortages; and cutting classroom sizes. Spiegel supports medical marijuana, but said she has reservations about legalized recreational marijuana, which is Question 2 on November’s ballot. She favors background checks for gun purchases, but with “common-sense” exemptions such as transfers between family members or transfers of guns for self-defense or hunting. Question 1 would require gun transfers to go through a licensed gun dealer, except in cases of temporary transfers or those between immediate family members. Welsh said he’ll focus on education — transparency in funding, in particular — the environment and the economy. “People want strong schools, a healthy environment and better commutes,” he said. Welsh has firsthand experience with the state’s economic troubles: He surrendered his $850,000 house to foreclosure in 2011 after his income fell 40 percent in the housing downturn. On more current issues, Welsh said “it is time” to legalize marijuana completely in Nevada. He also supports “reasonable and efficient” background checks for gun purchases, with exceptions for in-family transfers, hunting and self-defense. The winner will face Carol Linton, who’s unopposed in the Republican primary. Linton ran against Spiegel in 2014 and lost.